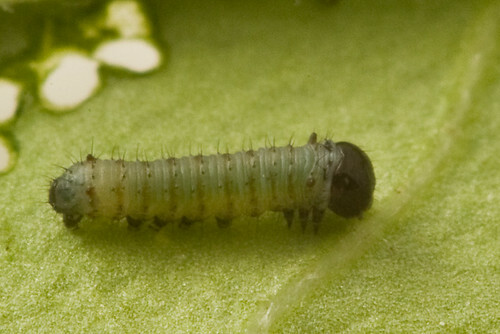 5th Instar, originally uploaded by eclectic echoes. Now in the 5th instar, 53.9mm long on day 14 post hatch. Many people are familiar with the incredible migration of the monarch butterflies from all over North America to Mexico. Coupled with it’s beautiful and distinctive coloration the migration is what makes this butterfly as well known and appreciated. According to recent DNA analysis by Smith et al. in 2005, there are actually two sub species of Danaus plexippus. The nominate, migratory species we have featured here is Danaus plexippus plexippus and there is a non-migratory species found from Georgia west to Texas south through the Caribbean and Central America to the Amazon Basin named Danaus plexippus megalippe. South of the Amazon is separate species of monarch (D. erippus) that Smith et al. estimated split form the D. plexippus only 2mya. The migratory subspecies essentially has two separate life cycles. The migrants overwinter in Mexico (where there are now significant anthropogenic pressures on their overwinter site) then in the spring mate and return to the southern part of the United States. They lay their eggs on the spring milkweeds in the south then die. The eggs that survive and make it to adults continue the migration northwards, each generation living as adults only for three to four weeks. In late August and September cooler nights signal a change in the cycle. The last generation, now 3-5 generations removed from the spring’s migration group, do not complete reproductive development and will not become reproductively active until the following spring. This group has a significantly lower activity in a key hormone for development – “Juvenile Hormone” (JH). The JH deficiency stops development, and significantly extends the butterfly’s longevity, from a few weeks in summer butterflies to several months in the migrants. Experimenters have manipulated JH in non-migratory adult butterflies with the predicted changes in reproductive activity and longevity. One of the most remarkable things about the migration of monarchs is that each year the migrants are on their maiden voyage. The entire migration route and cues are genetically wired. In their paper “Chasing Migration Genes: A Brain Expressed Sequence Tag Resource for Summer and Migratory Monarch Butterflies (Danaus plexippus)“, Haisun Zhu, Amy Casselman and Steven M. Reppert created a library of expressed sequence tags (EST’s) for D. plexippus plexippus. An expressed sequence tag is a unique sub-sequence of DNA in the encoding region of a gene which can be used to positively ID the gene and help map the gene to a specific chromosome location. The researchers created the library with samples from both non-migrating (summer) and migrating (fall) butterflies. They estimate that their library could represent about 52% of the encoding potential of the D. plexippus genome. Throught the library they discovered that three genes (allatotropin, juvenile hormone acid methyltransfersase, and takeout) are responsible for increased JH activity in summer butterflies. The library also contained several genes identified with the circadian clock which governs and guides the monarch migration and a new allele of an Na+/K+ ATPase in summer only monarch which should confer more resistance to the toxic effects of milkweed than that reported previously. 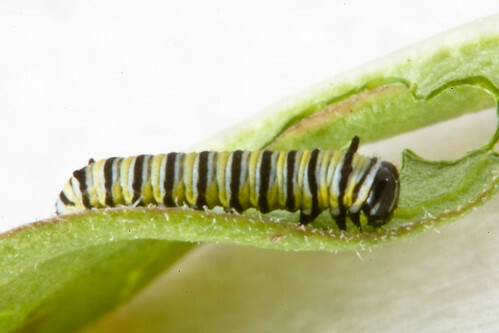 4th Instar, originally uploaded by eclectic echoes. 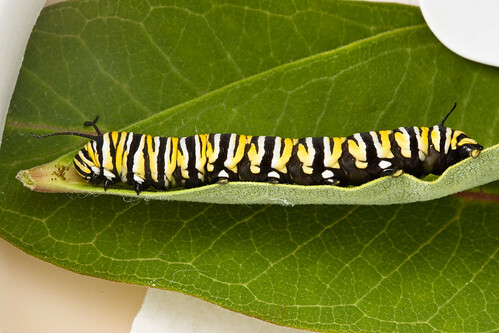 This is the 4th instar stage Danaus plexippus larva (monarch caterpillar). It is 11 days post hatch and 26.2mm long. Very few eggs laid actually make it to become pupae, let alone successfully pupate into healthy adults. The sources of mortality are many and come at different stages of the life cycle. Monarch eggs and larvae are routinely eaten by several insects and arachnids, and parasitized by flies and wasps. One predator of D. plexipus is the non-native Asian lady beetle, Harmonia axyridis, which was intentionally introduced to the United States as a biological control as far back as 1916. H. axyridis preys primarily on aphids as many other lady bird beetles, but it also eats other soft bodies insects such as larval stages of Lepidoptera. H. axyridis has become a dominant generalist predator in many agricultural areas of the United States where common milkweed and D. plexipus are common as well. In a 2003 paper published in the journal Biological Control, R.L. Koch et al. quantified the predation of H. axyridis on D. plexippus in both laboratory and controlled field experiments. They found that the 3rd instar lady bug larvae preyed on monarch eggs at a rate of up to 25 eggs per larvae per day. The rate of predation on 1st instar D. plexippus larvae was as high as 15 per H. axyridis per day. The adult H. axyridis also preyed on the eggs of D. plexippus at a rate that is a linear response to the prey density. Though the field and lab experiments were conclusive that H. axyridis will eat significant numbers of eggs and 1st instar larvae of D. plexippus, these trials were conducted without aphids present. 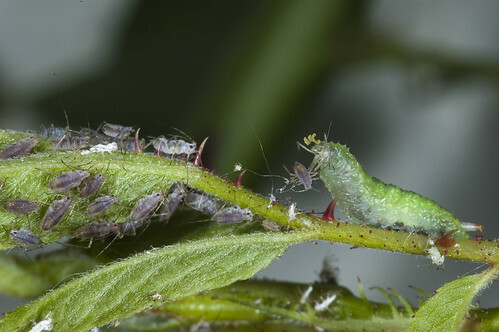 The availability of aphids may reduce predation rates on both eggs and 1st instar monarch larvae. In our own garden we have seen a single D. plexippus egg hatch outside with a 1st instar larvae that was not seen after the first day. We “rescued” one viable egg and raised it indoors as an experiment for our son. We counted 14 other eggs which were positively ID’d and examined under dissecting microscope. All were found to have been penetrated with a slit cut into the wall of the egg and the egg insides eaten, often with a trail left on the outside of the egg. In obtaining food for the 4th and 5th instar stages of the monarch, we cut a common milkweed plant at its base and brought it home. Each leave was examined for eggs, mites and fungus then washed and stored in a ziplock with dry papertowel in the refrigerator. That single plant had a further 16 egg remains on it. Each of which had a narrow slit through the case. Empty, originally uploaded by eclectic echoes. crab larvae saying hello, originally uploaded by nature adrift..
Definitely one of my favorite megalopa images ever. The megalopa stage is the final larval stage before a young crab molts and becomes an juvenile crab with all the adult body characteristics (although tiny) of the species. 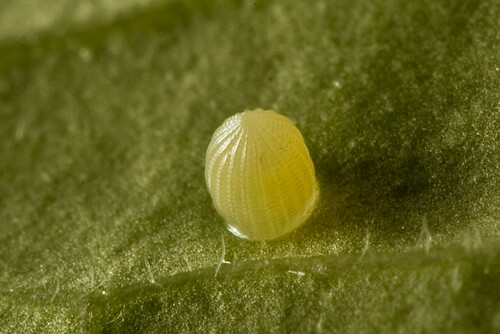 3rd Instar, originally uploaded by eclectic echoes. Day 7 post-hatch, (1 day after second molt) this new 3rd instar Monarch caterpillar is now 12.2mm in length. 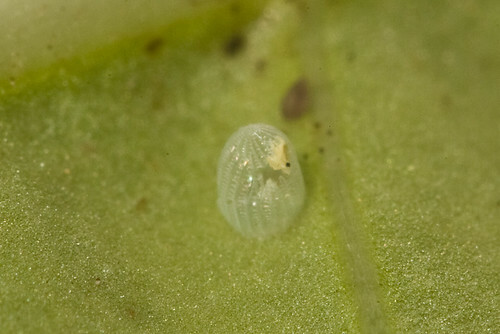 2nd Instar , originally uploaded by eclectic echoes. 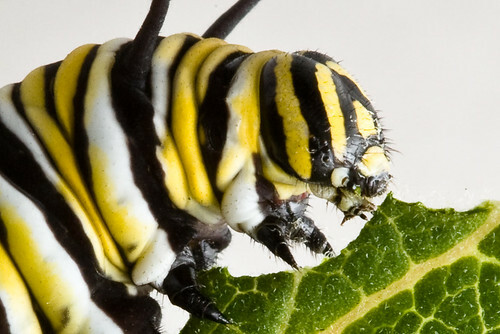 1st Instar – Detail, originally uploaded by eclectic echoes. Last night someone emerged from it’s egg while we slept. Now 1.5mm long. This is the 1:1 pixel crop. We’ll be tracking how much it eats and it’s daily growth as a project for my son, as things develop I’ll post updated pictures along with the measurements. Adult monarch gender is very easy to discriminate using the pouches (spots) in the hind-wings, but for the larvae it’s another story. In the pupal stage there is a small visible difference with females having a line dissecting the 8th abdominal sternite. You may need magnifying glass to find it though. With the larval stages (i.e. caterpillar) there is no external difference at all. If dissected, the male testes can be found as red or pink sac(s) dorsal to the gut in the 6th abdominal segment of late instars. Hughes, P.R., Radke, C.D., Renwick, A.A. (1993). A Simple, Low-Input Method for Continuous Laboratory Rearing of the Monarch Butterfly (Lepidoptera: Danaidae) for Research.. American Entomologist, 39:109-111. Egg Mk. III, originally uploaded by eclectic echoes. This egg is literally just a speck. This shot (a 1:1 pixel crop from the large size) was with a 100mm Macro, a 1.4x teleconverter and 48mm of extension tubes. The egg itself is 0.5 mm (0.02″) in diameter and ~1.0 mm (0.04″) in height. We watched the butterfly that laid an earlier egg (Egg Mk. I) on these same plants. She went from plant to plant sampling the nectar and exploring the leaves. She chose what appeared to be the healthiest of the four plants in the garden to lay her egg on. We judged it as the most healthy because when it was recently transplanted it had the largest most robust root system and it had recovered faster from the transplanting. When Egg Mk. I was laid all the plants, but one, were visually the same and appeared fully recovered from transplanting. The recent two eggs were similarly laid on the same plant. What made all three females choose the same plant? Butterflies have complex chemoreceptors on their tarsi (roughly analogous to feet), which allow them to taste the flowers and leaves they land on. Several researchers have explored the chemical cues for oviposition (laying of eggs) in monarchs. They have found that certain flavinoid compounds in host plants play a role in stimulating oviposition in butterflies. When a female butterfly lands on a milkweed plant such as our butterfly weed (Asclepias tuberosa), using the tarsi on her forlegs and mid legs and using chemo receptors on the tips of her antennae, she can “taste” the species of plant, it’s age, physiological condition and key compound concentrations. Monarch butterflies, like all Danaidae butterflies, lay their eggs on, and as larvae feed on, milkweed plants of the genus Asclepias. One characteristic of these plants is that they all contain cardenolide glycosides, a toxic steroid that can cause heart arrest in most vertebrate animals (notable exceptions include the black backed oriole which is a primary predator of monarch butterflies). 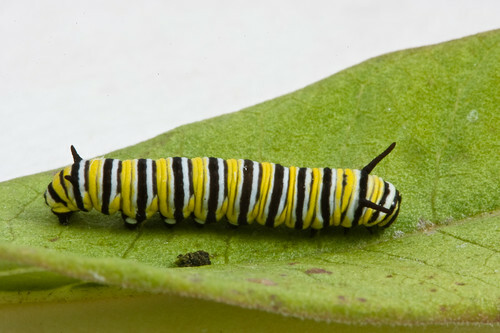 Monarch larvae take up the cardenolides and sequester them in their body, so it is an important compound for the survival of the larvae and adults. 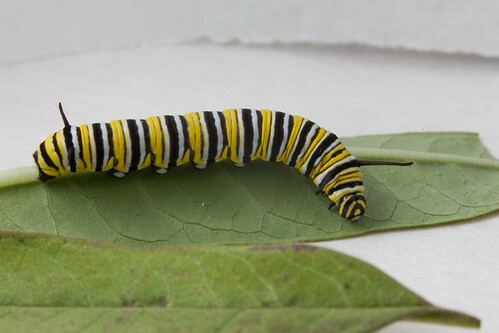 In too high a concentration however, it can negatively impact larval development and even cause larval mortality, especially in the first instar stage. Too low a concentration and there is little or no actual chemical defense afforded to the butterfly, too high a concentration the butterfly risks increased mortality and deformity. So our female butterfly was carefully selecting which plant to lay her egg on, to give the larvae the best chance of success. I have always loved volcanoes and I feel a special love for Mt. Fuji and Mt. Hood. 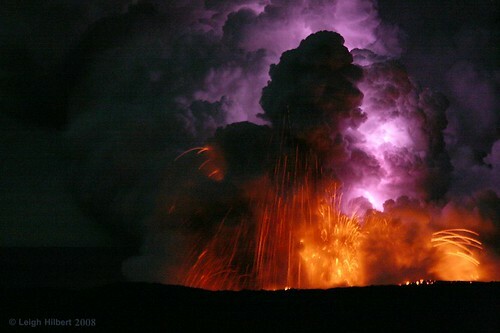 My friend SparkyLeigh lives in Hawaii and is capturing the power and beauty of the current eruptions there, you really should take a visit to his Molten Lava set on flickr. Epistrophe eligans, originally uploaded by Michel Vuijlsteke. Some hoverfly species, such as Epistrophe eligans are highly beneficial to gardeners eating aphids and other “pest” species. I really like the image Michel captured, and it reminds me of the old Godzilla type monster movies.